Born in Paris of Russian parents, Erwitt came to the United States with his family in 1939. He studied photography at Los Angeles City College from 1942 – 1944 and then studied film at New York’s New School for Social Research from 1948 – 1950. Erwitt was drafted for military service but continued taking pictures, working as a photographic assistant in the United States Army Signal Corps in Germany and France. Erwitt became an associate of Magnum Photos in 1953. He was a freelance photographer for Collier's, Look, Life and Holiday and eventually served as Magnum’s president for three terms. 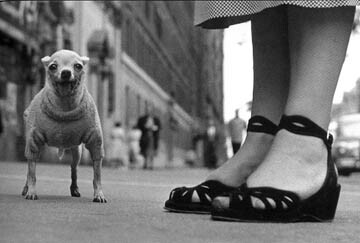 Erwitt has had his work featured in the international press and over twenty monographs. Erwitt was most recently awarded the International Center for Photography’s 2011 Infinity Award for Lifetime Achievement. Hailed for his understanding of “the decisive moment,” which appears in both intimate portraits and witty images of everyday life, Erwitt had a major retrospective of his photography, “Personal Best,” exhibited at the ICP in conjunction with the award.